Today's featured small space is a cottage after my own heart. 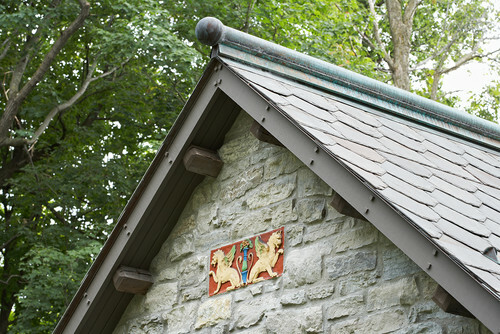 Built of stone on a wooded site that was once part of a 1900's camp, The Gatehouse has it all. This home, designed by Murphy & Co Design of Buffalo, Minnesota, owes its uniqueness not only to outstanding design, but to the use of reclaimed building materials and architectural antiques. Charming rain cups greet us at the front entrance. The front facade was constructed with Platteville limestone reclaimed from the 1889 Lake St. bridge pilings in Minneapolis. We enter the cottage into the great hall. 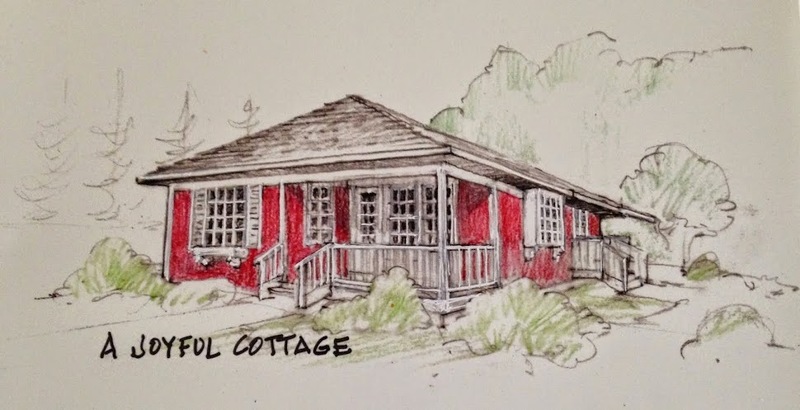 The open floor plan makes this cottage seem much larger than its 860 sq ft. The kitchen, breakfast alcove and living room are individually defined by employing ceiling beams, posts, and changes in ceiling heights. 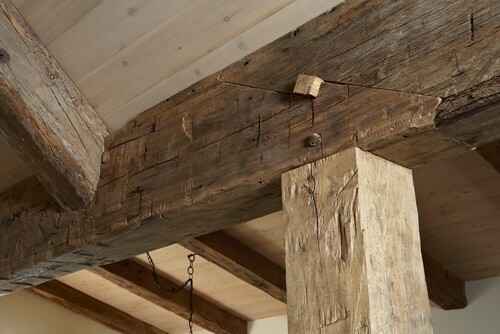 Oak timber ceiling beams came from an 1860's Houston County, Minnesota barn. An 1870's barn in Marshfield, Minnesota was the source for the pine timbers. Flooring was reclaimed from an 1880's barn in Osseo, Wisconsin. 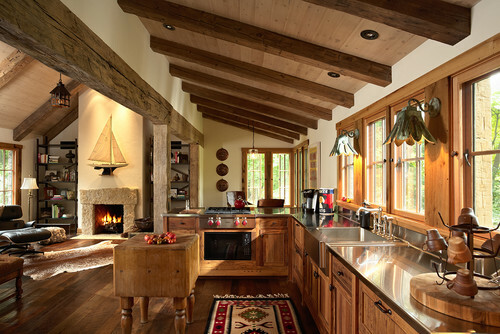 The kitchen keeps to the home's rustic theme with wood cabinetry and an antique butcher block table. Two wall sconces came from an early 1900's Wisconsin cabin. The countertops are stainless steel. Vintage French copper pâté molds are displayed on the far wall. Bathed in natural light, the eclectic breakfast alcove invites lingering. The "leather sheet" chairs came from Vermont, the rug is antique, and the vintage pharmacy rack is French. 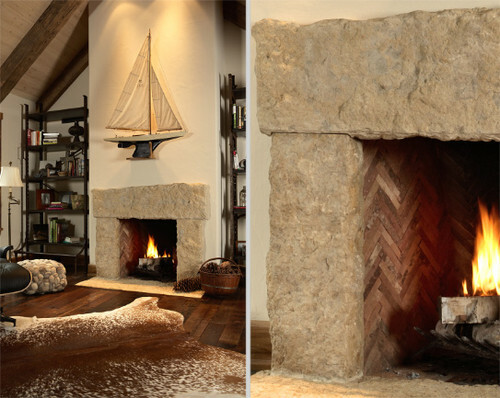 The fireplace stone surround was quarried from Derby, Iowa. Breadstick bricks from Italy were installed over the firebrick in a herringbone design. 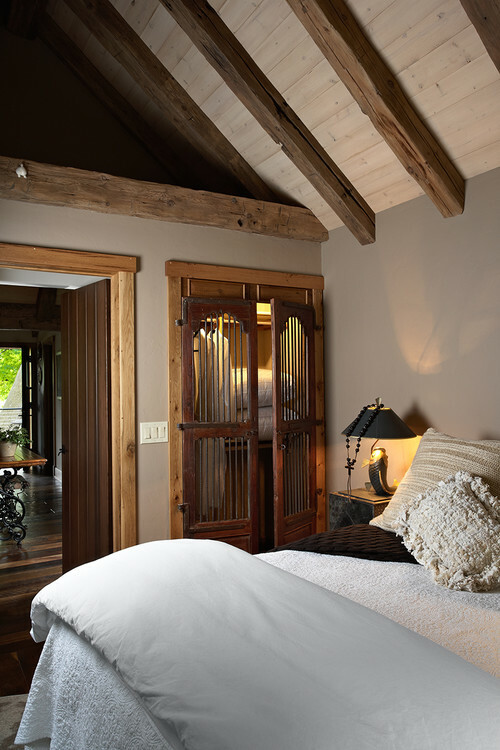 The bedroom's millwork came from an 1870 tobacco barn in Winchester, Kentucky. Beautiful closet doors were purchased by the owner in France. The little white spot in the upper left corner is a "rear-end" of a white stuffed mouse, left there as a joke by the contractor for the owner's discovery. 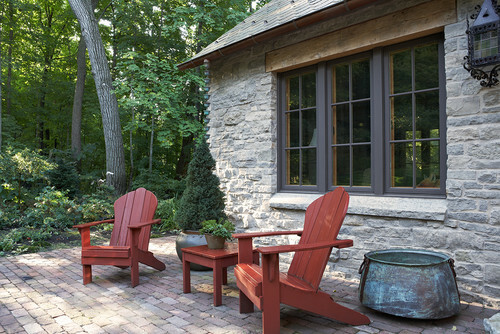 Relaxed outdoor living spaces enhance the livability of The Gatehouse. Sitting terrace bricks were salvaged from streets in Minneapolis. The vintage urn is from Jerome, Arizona. Climbing roses on an old French Orangerie window adds interest to the side of the cottage. 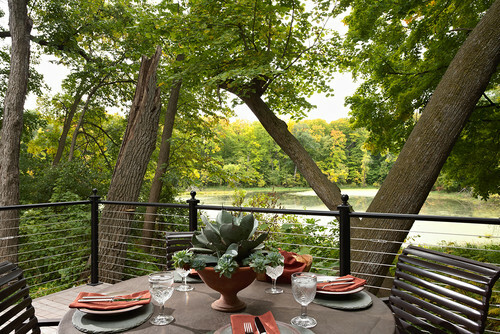 A pond at the rear of the house sets a romantic mood for dining al fresco. We can't end our tour without a closer look at the exterior details of this delightful cottage. Here we see the timber pegged corner window support. The wood lintels are reclaimed timber. 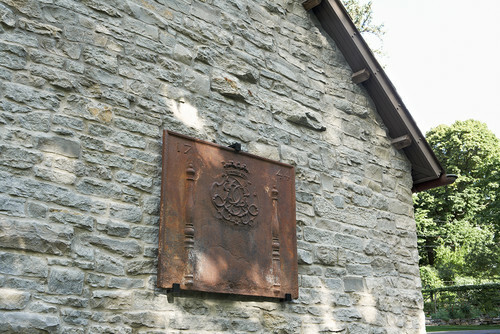 Exterior adornments include an antique French fireback dated 1744. And the owner's winged lion tile inset. 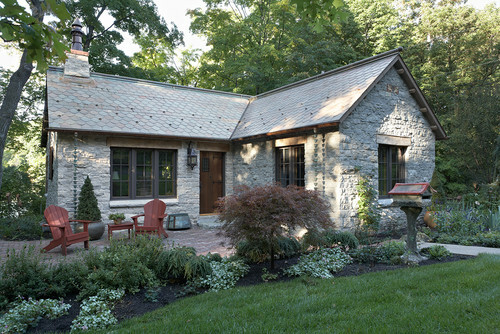 I'm in love with this enchanting cottage. It's new, but it looks old, and that in my book is a plus. Is it weird that my favorite thing is those French slatted closet doors? Haha. The outdoor spaces are just dreamy! I love this one. I love the open and all the light. I'm ready to move in if it's available! Simply lovely especially with all of the unique beams, reclaimed and natural parts of the construction and the layout. I'm in awe! I've never seen or heard of rain cups before but I'm fascinated. Any info you can pass on? 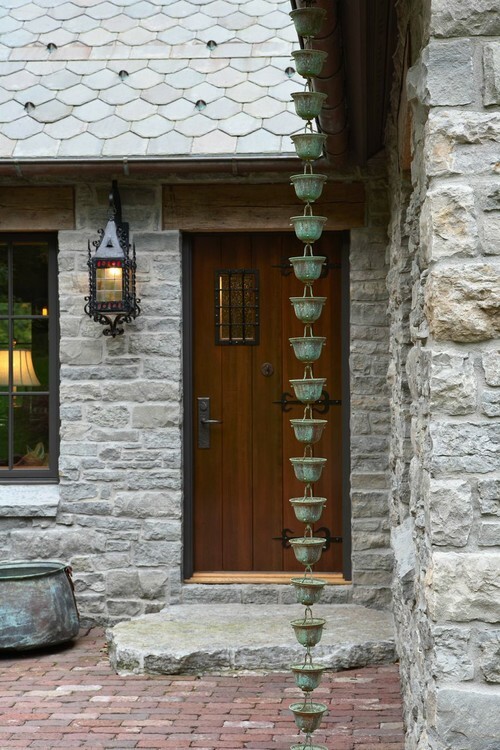 Rain cups, also known as rain chains, are used in place of traditional downspouts for decoration, as well as function. The water flows from cup to cup, becoming a pleasing water feature. Oh my Nancy this is a good one. 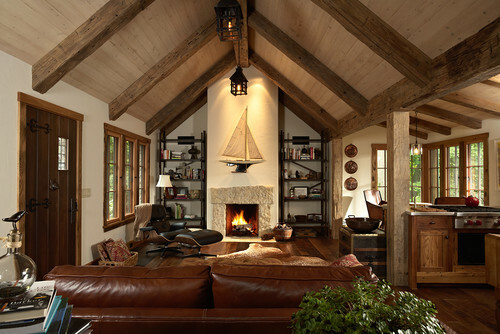 Love that fire place and all the beautiful rustic wood. Love the open concept too. Just too sweet. wOw raincups - do not see them very often, I'm loving the roof. Inside I'm impressed by the rustic additions (especially the barn beams) how everything compliments and suggests an old cottage. Amazingly convincing, I am in awe of this cottage. Wow, what a beautiful use of old wood, bits and pieces. I love it. Good morning Nancy! What do I think? Well, I live in Minnneapolis, a fascinating city that I believe is, in conjunction with its twin city Saint Paul is the hub of the most gorgeous architecture I've ever seen. 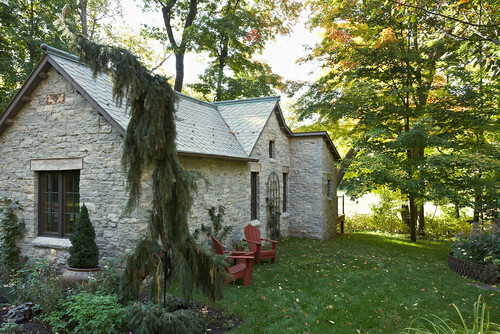 I lived in Los Angeles and Boston where there are pockets of fabulous homes, but the Twin Cities by far has the most concentration of literally CASTLES, mansions, cottages and wonderful new homes, all built of course in either the Scandinavian style of angular and practical open design or in the European style of cozy and cute. This home you share is familiar to me, since there are many of these homes that surround me. Our home is post-war brick with a style all it's own, but certainly many of the houses around the lakes have all of these stone features. The beams are SO Minneapolis. Many of our homes have them and the French influence in architecture and gardens here is striking. Thank you for featuring a home found in and made by the great design sensibilities of my hometown. I'm glad you enjoyed the feature, Anita. I think it's a fabulous home. Your photos are amazing, Anita! Yup, that's what I have in mind for my next house!! Gorgeous! Hi......I think I could move there yesterday..I'd love to be a guest..they have taken recycle to the highest level..an used it Beautifully..Thanks for finding this one to share..hope you have a Great Sunday.! I love the gatehouse. It is so open and airy! 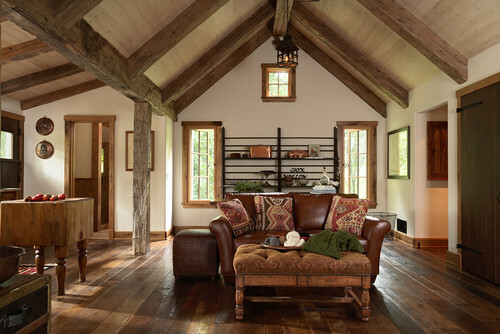 I love the rustic beams and stone fireplace surround. It's so pretty! I LOVE this one! I can imagine living in the beauty of every corner and nook. The rain cups always fascinate me. One of the ways I walk in the morning hours takes me past a home with some lovely rain cups at the front corner. I've tried to envision them at a corner near my front door but I'm afraid the torrents of rain that often fall during the winter months would make them ineffective much of the time. Perhaps I'll find another place to add them to my home! I loved all the beams . . . stone . . . openess! Much larger look than 830 sq ft . . . I think I want this place! Oh my Nancy, what a beautiful cottage. I don't think there is one thing I don't like about it. I love the beams, the fireplace, the closet doors...and the outside is just a good as the inside. I could live there in a heartbeat. Thanks so much for sharing this one Nancy, and I hope you have a great week. Oh my! This is one of my favorites!! The wood beams, the windows, the history in the small details make it a wonderful find!! Thanks for sharing it with us! It was my pleasure, Dawna. Glad you like it. This is THE PERFECT home! Every detail is done with a lot of thought. This cottage is charming. I love all the old wood that has been included in the design. Just when I think there's a favorite small home shared on your blog, there's a new favorite. This is my new favorite. 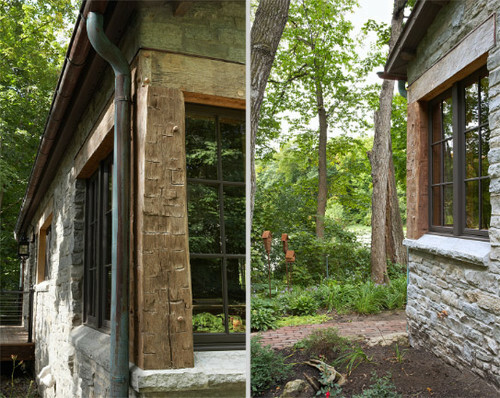 I just love that they used so much old wood and reclaimed pieces from the surrounding area! And how they separated the different "rooms" using lighting, and the ceiling beams. Absolutely a magnificently done cottage! Don't know how it could get much better than this... and of course the outdoor setting, truly relaxing and wonderful! Enjoyed the tour Nancy! 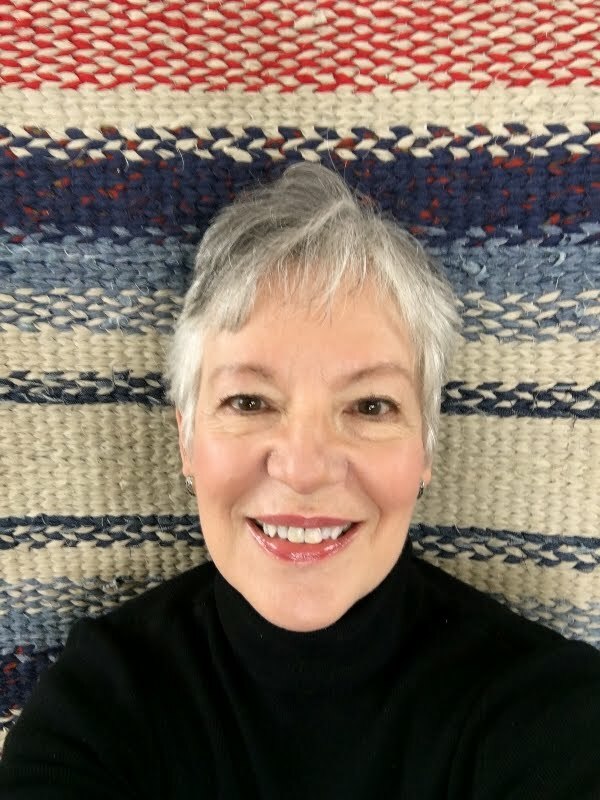 Everything about this one is a home run, Nancy, right down to those super sweet red chairs!! Thanks for sharing! I love it all! The rain cups, which I've never seen before, and that marvelous slab of stone by the front door, and the stone and roof tiles. Can't believe it's new! They did it wonderfully.